An MRI on his right shoulder showed inflammation after Betances experienced lower velocity numbers in spring training. Yankees pitchers Dellin Betances takes infield drills during Spring Training at George M. Steinbrenner Field in Tampa, Fla. February 18, 2019. 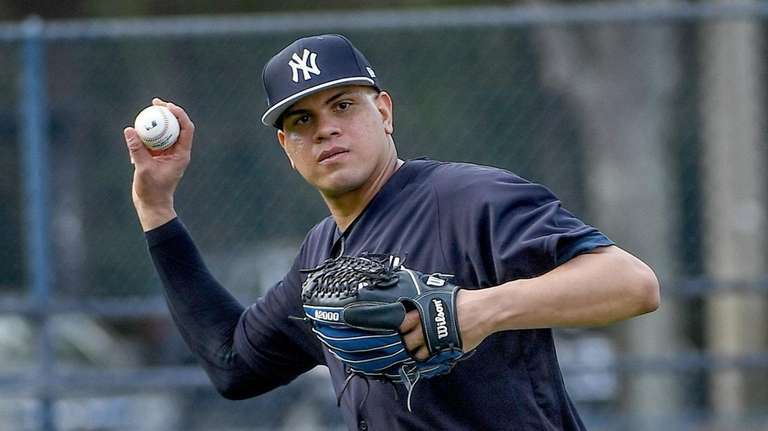 TAMPA, Fla. — As he struggled to get his fastball consistently above 90 mph this spring, Dellin Betances maintained all was well. In previous springs, the reliever pointed out, he had been a slow starter with his fastball velocity, but added “when the lights come on” for the regular season he would be ready to go as he always has been. It turned out, however, something more than a slow-to-build arm caused the diminished velocity. Yankees general manager Brian Cashman said that an MRI taken Tuesday morning showed “right shoulder impingement,” essentially meaning inflammation. Cashman said Betances, slated to immediately start a regimen of anti-inflammatories, will start the season on the injured list. But his belief is Betances, who joined CC Sabathia, Luis Severino and Aaron Hicks on the list of players who won’t be on the Opening Day roster, will not be out for an extended period. Betances, a free agent after the season, reported to camp almost a week after his fellow pitchers because of the birth of his first child (an excused absence by the club) and believed the low velocity reflected his late arrival and the need to build up his arm strength. But Betances’ most recent outing, Sunday in Clearwater against the Phillies, was not encouraging as his velocity actually decreased a tick or two from the preceding ones. His fastball sat in the 88-90-mph range, according to opposing team scouts, and Cashman suggested the MRI to Betances to be sure there wasn’t anything serious going on. Betances, who believed he might have been rushing himself this spring to catch up, agreed to the test and was somewhat relieved. The 6-8 reliever, who estimates he’ll be able to throw on flat ground in 3-5 days, said he isn’t worried. Cashman stressed his concern level is low as well. And while Betances is a significant cog in the bullpen, there are still an array of power arms such as Aroldis Chapman, Chad Green, Adam Ottavino, Zack Britton, Tommy Kahnle and Jonathan Holder that Aaron Boone can call on.